Has anyone on this thread tried to conduct an appropriate psychological review of the Whitechapel murderer that preyed upon vulnerable, poor class (high risk) women? If one were to dwell inside the brain of this killer, I am sure most of you would be revolted and terrified to find what is "underneath the hood" as one would say. This man is clearly mad; whether the method in which he went about to dispatch and extinguish his victims had any planning to it I can not say, but I am of the opinion that he was an unorganized, blitz serial predator and attacked his victims suddenly and violently. From what I gathered from previous replies to my past inquiries, he either killed the victims before inflicting the injuries to the body. Therefore I can speculate that the pain of his victim was not something he was after. It was the mutilation/dissection aspect. And this escalates with each killing till it blows up with the MJK murder. While knowing what the motive was for the killer and what drove him to kill, understanding this and applying it so one may therefore understand what was going on in his mind are two different things. Everyone may love a good murder mystery but the more I study this case the further I now try to steer away from it. These were people who died in terrible ways. This man was an absolutely TERRIFYING little bloke. And I mean that in every sense of the word: this man is SCARY. I mean, whatever was going on in his mind, what he was thinking/saying to himself, the self-satisfaction that he got from these killings; what he did to that poor woman in Miller's court - THAT is the thing made of nightmares, and is true horror and the closest thing I could ever imagine to Hell. I think he literally has to transform from a regular normal looking Eastender into a monster when he attacks. As in his facial features would contort. 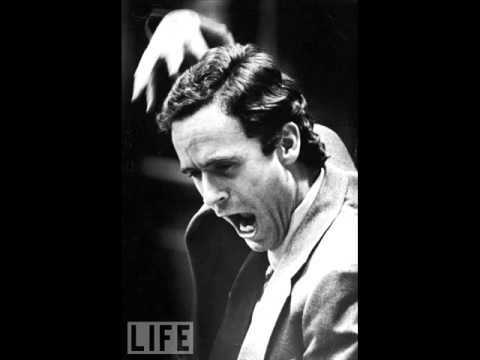 Ted Bundy was reported to transform like this by many witnesses. This was apparently even witnessed by the jury who got a glimpse of it during a trial where he interrogated his own victim. No wonder why serial killers shouldn't represent themselves. Dahmer would start chanting and his eyes change and he would go into a trance almost getting himself charged to murder. So in a funny way, there is a connection with Dr. Jekll and Mr. Hyde which was playing in theatres at the time. The press cartoons even got the crossover and people wrote in letters suggesting the actors may be JtR. It is the level of hatred that gets me. This man was one of the most extreme misogynists that have ever existed. Yet, even an unfortunate, who needs money, seems to have not been worried about meeting this person, even at the height of the Ripper murders. Peter Sutcliffe's friend, Jimmy Saville... errr... I mean Trevor Birdsall knew that Sutcliffe had a mega hatred for prostitutes. Even watched him try to attack one before the serial killings. Trevor Birdsall eventually put 2 + 2 together and informed the Yorkshire police about Sutcliffe, who was in their database. The information got lost in a chaotic system. I wonder if the identity of JtR may in the many letters sent to Scotland Yard and the Newspapers. I do not think any of the victims expected to have been harmed in that extreme. I am sure most of them were used to violence enacted out and I wouldn't be surprised if many of them were not brutalized by their husbands, lovers, or random men of the street a fair amount of times. They were just desperate and at the wrong place at the wrong time. From my general understanding, most of the victims were not actually supporting themselves by prostitution alone. Most of them may have not even been soliciting the night of their murder. And what a way to give me nightmares! Are you trying to not let me sleep tonight? Jimminy Crickets! Yes, he was a hateful little bloke. But was it really hatred that drove him, or was it fear or something else? Did he possibly get any sexual relief from his mutilations? I wonder if it was something else besides a pure hatred of women that drove him. . .I do not want to get into the mind of a killer. They have no empathy and everyone is a tool at their disposal. To think of meeting someone who will look at you and think of dissecting you apart is terribly frightening. So he killed her in her own room? This is a point that has surfaced a bit lately Sam, is the woman on the bed the same woman that Joe Barnett knew and later barely identified as Mary Kelly, or is it a woman that is found in Mary Kellys bed disfigured almost beyond all recognition, or is it a woman who called herself Mary Kelly but was not actually a Mary Kelly, or was it a woman that was legitimately named Mary Kelly? Ive been here long enough to see how good some member/researchers are and it troubles me that there has still been no solid confirmation of her story. That and the fact that this woman was mutilated, as I said, almost beyond a reasonable identification, makes me consider an alias or a misidentification as pretty plausible. There is nothing to prove that the Ripper was a misogynist. He may have been and he may not have been. Killing somebody is not necessarily a sign of hating that somebody. Jeffrey Dahmer was very fond of all the people he killed, and only killed them on account of a wish to be able to keep them close to himself.